Step into Metra’s tower at the A2 interlock and you step back in time. The tower, near Grand Avenue and Western, was built in 1907. The switching system inside was state-of-the-art. At least it was when it was installed in 1932. The problem is it’s still in use. "A lot of care and a lot of maintenance and a lot of attention has gone into keeping this operational," said Metra’s Rich Oppenheim. "This was the best thing that could be purchased in the 1930s." The inside of the A2 looks like a movie set. A "leverman" walks along a Jules Verne-style contraption, moving levers to activate the 31 switches in the yard. Over it all, an 80-year-old electric map shows the locations of trains approaching a spaghetti network of intersections. All told, seven of Metra’s eleven lines pass through the A2 yard, travelling to all six counties on the Metra system. "There’s no question about it. It’s a very intricate dance that goes on here in rush hours," Oppenheim said. "On a typical weekday, there are 358 moves that go through here in a 24 hour period." The railroad’s train people point to the A2 as the poster child for what’s needed at Metra. Amid almost daily stories about political intrigue and the comings and goings from the agency’s board, they will tell you that what the public really should be talking about is money and the infrastructure which needs updating if Metra is to fulfill its mission. "It’s about $10 billion, and unfortunately through inflation, that number is probably going to grow," said board member Norman Carlson. "I think we really need to look at $11 billion or $12 billion by the time we get to doing the projects." The A2 alone would need about $100 million to be brought into this century. Some put that figure as high as $180 million. With bells clanging around him and leverman Stacie Kransdorf flipping the controls, Carlson marveled at the shocking efficiency Metra is able to maintain with a system which was installed when Herbert Hoover was president. "We’re in a building that’s 106 years old. We have an interlocking machine that’s 80 years old," he noted. "And it’s due to the dedication of the Metra employees that this facility works so well." Carlson expressed frustration that Metra rises into the public eye only due to the current squabbles about allegations of political meddling. The public, he believes, is missing a much bigger issue. "We are having the wrong discussion, and I’m really hoping we can get it around to the right discussion," he said. "Long term, even medium term, the economic model that we have today is not sustainable." That economic model is as simple as it is inadequate. Metra gets 55 percent of its operating costs from fareboxes. The remaining 45 percent comes from sales taxes levied throughout the railroad’s service region. Expand the network in any way and operating costs will increase but those sales taxes will remain static. That leaves fares, as the only variable. "Are we going to be increasing fares this year? No," Carlson assured a visitor. "Are we trying to figure out how to balance the budget? Yes!" But the fact that the Metra system is as good as it is, is something of a rolling paradox. While the railroad has identified some $10 billion dollars in needed capital projects, they only have identified funding for about 25 percent of those over the next 10 years. Federal funding is not even an option until engineering studies are done, and most of those studies have not been performed. Carlson pointed to a ton of brainpower at local universities like DePaul, Northwestern, and the University of Illinois with well-known transportation schools. "Why can’t we come up with projects that university students could help us with," he asked. "This may be a very creative way of solving some of our challenges." Carlson himself is something of a unique creature on the Metra board. He’s a railroader. Indeed, he was literally born into railroads, his mother giving birth in the old Illinois Central Railroad hospital in Hyde Park. "In my college days I ran one of these things," he laughed, tapping the massive A2 console while noting the historic significance of the spot where he stood. 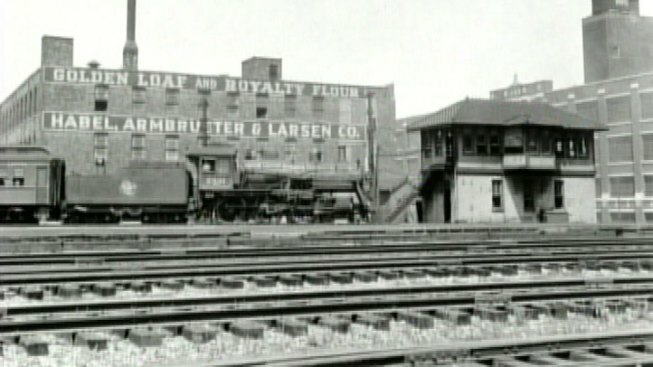 Chicago is America’s railroad capital. And the very first train to enter the city, rolled through what is now the A2 yard in 1848.